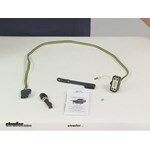 Curt custom fit vehicle wiring for your 2016 Ford F-150 are available from etrailer.com. Installation instructions and reviews for your Ford custom fit vehicle wiring. Expert service, and cheapest custom fit vehicle wiring price guarantee. etrailer.com carries a complete line of Curt products. Order your Replacement OEM Wiring Harness for Ford F-150 part number C56110 online at etrailer.com or call 800-298-8924 for expert service. Today we're going to be taking a look at part number C56110, this is your replacement OEM wiring harness. This product is going to fit certain years of the Ford F150 and the E series vehicles. It's going to supply your 4 way flat plug at the back of the vehicle. Now, this is designed to be an exact replacement for a damaged, or needing to replace OEM wiring harness. Here on the 4 way flat, it's going to come with the protective cap, that way you can protect your connection points when the connector is not being used. Just goes over that area there, and then comes over the connectors. It's also going to come with your detailed instructions, it's going to come with your cable ties to secure any excess or lose wires that you may have, and it's going to come with self taping screw to make a good ground connection right here with the ring terminal, and white wire. Very easy installation, you do not have to worry about cutting or splicing any of your wires. All you have to do is locate the OEM trailer wiring harness connector on top of the spare tire support, it's usually located on the driver side, it favors the driver side. You're going to insert the new connector. The connector should match up perfectly, make sure it's fully inserted, it's going to lock and secure into place for a nice, tight, secure connection. Then you're going to need to make a good ground connection using an existing screw with the nut, or you can use the supplied self taping screw. Place that right here through the ring terminal that's attached to our white wire, which is our ground wire. Once you have that connected you can then route the 4 way back to the rear of the vehicle, and then you can secure it in a convenient, out of the way location, near the hitch. Again, detailed instructions, these are going to have pictures that are going to help you through the installation process, very detailed. Once you have that done you can go ahead and use some of the cable ties to secure the wiring, keeping it up and out of the way. That's going to do it for today's look at part number C56110. Do you have a question about this Custom Fit Vehicle Wiring? Factory wiring could be any color since there is no one standard that all manufacturers follow. You will need to test the wires by function using a circuit tester such as # ALL640595 if you do not already have one. I have included a picture that shows a standard 7-Way and how it is pinned out. That should help if you still have the wires attached to the factory connector. We have 4-pole wiring harnesses for the 2018 Ford F-150 such as Curt # C56110 which is a direct OEM replacement. This item and the similar Hopkins part # HM11140735 plugs in at the rear of the truck with a rectangular plug. Please refer to the linked photo. 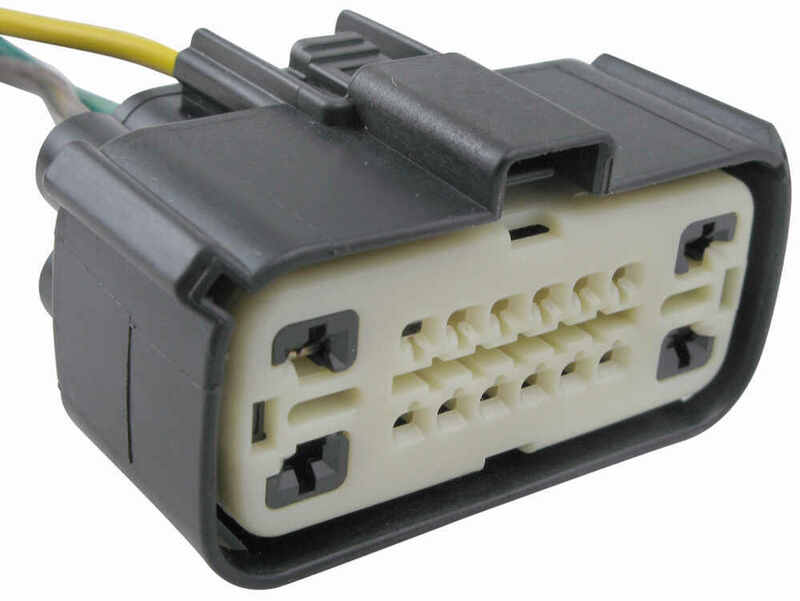 If instead your truck has a round U.S Car type connector you can use Curt # C55774 which includes both 4-pole and 7-way type connectors on one product. Highest quality custom fit vehicle wiring for the best price. Most detailed, accurate custom fit vehicle wiring information available. Fast shiping and great communication. Product was very easy to install and it came with great directions. Very happy with this company.